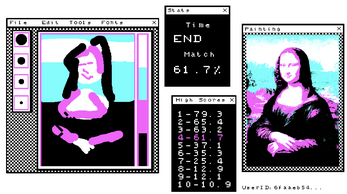 Using 1984 IBM PC Paint, quickly forge CGA masterpieces for an eccentric art collector. You only have 90 seconds for each forgery, will your painting pass muster with the eccentric collector or will you fail and have to go back to working at the Byte Shop, fixing ancient IBM clones in the back room? Inspired by the wonderful Sloppy Forgeries! Classic four color CGA palette with four brushes to unlock the full breadth of your Old-School Paint technique. Seven grand masterpieces to recreate. 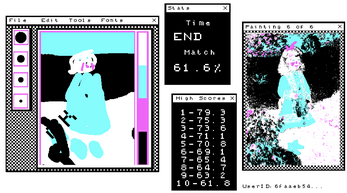 Release of CGA Fast Forger & New Features! Celebrating Our CGA Fast Forgers! Day 2 Update Upload/View Highscore pictures!